Mixer mounted in a stainless steel mix tank. TERALBA Industries has released a range of Mixquip drum mixers using lightweight air-driven motors. 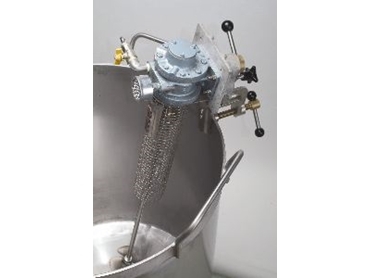 The mixers are constructed using 316 stainless steel for all wetted components. They build on the Mixquip Superflo Propellor technology. Superflo propellors produce a high-velocity axial flow, resulting in a turbulent and rapid mixing action. Infinitely variable speed mixing is achieved by adjusting air flow using the integrated valve. The mixers are lightweight and easily moved from one vessel to another. Applications include food, beverage, wastewater, pharmaceutical, chemical and general manufacturing. Titanium, duplex stainless steels and polymer-coated shafts and propellors are available for aggressive environments.